Bound to bring a rosy glow! 1 Put the wine and sugar in a saucepan and heat gently, stirring, until the sugar is dissolved. Slice orange, cut slices in half and add to wine, squeezing them a little (and add any juice on the board). Add spices then let it ‘mull’ over a gentle heat (don’t let it boil) for 10 minutes. 2 The mulled wine can be served immediately, or it can be left to steep for several hours, then reheated when required. Add brandy just before serving. You can make mulled wine ahead and transfer it to a preheated slow cooker and keep it hottish, but not boiling, on a low setting. Leftover mulled wine will keep in the fridge for a day or two. To make mulled wine less alcoholic add ½ cup water, and omit the brandy, or add a cup or two of cranberry juice in place of some of the wine (you might need to cut back on the sugar or leave it out entirely if using sweetened cranberry juice). 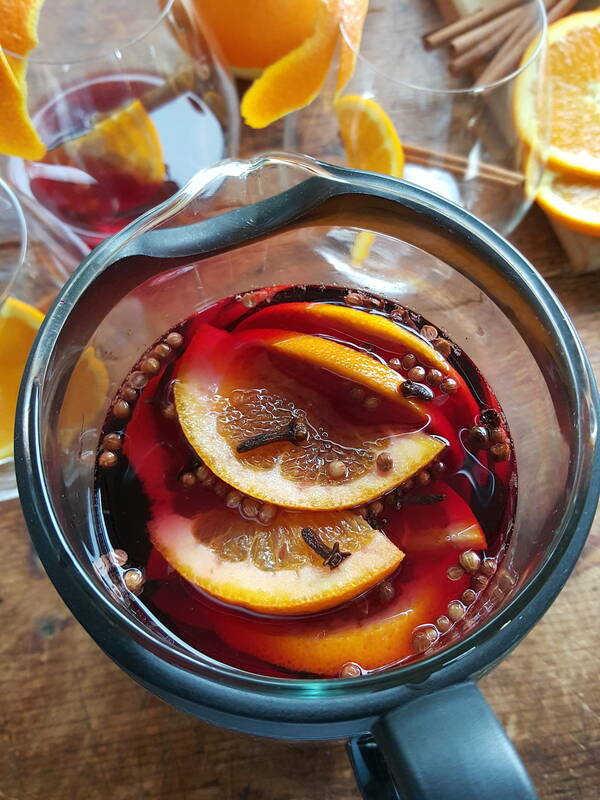 Mulled wine is the perfect drink to pack into a thermos to take on a winter picnic. If you are worried about the alcohol content, bubble it up and let it evaporate. This has long been a favourite in the Biuso household, essentially to ward off a cold, but sometimes just for the sheer enjoyment of having something fragrant and warming to sip. Husband Remo being a fire fiend is only too keen to knock up a pot of it at the mere mention of the words Vin Brülée!